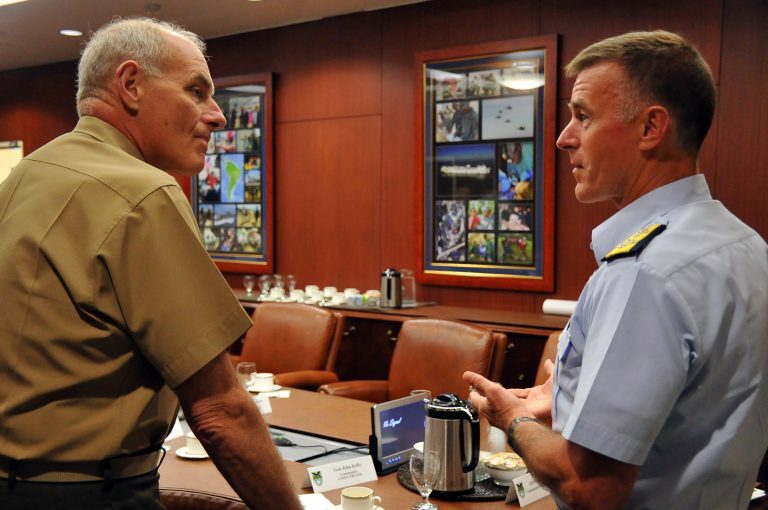 Coast Guard Commandant Adm. Paul Zukunft (right) meets with then-Southern Command chief Gen. John Kelly. The US Naval Institute has published 25th Commandant, Admiral Zukunft’s, thoughts on the impact of the government shutdown on the Coast Guard. He makes a good case, but one statement in particular really hit me. I have been reading the USNI news feed, and every week they have a story titled “Fleet and Marine Tracker,” that talks about ongoing operations and includes a breakout of vessels deployed and vessels underway. I don’t actually have a definitive average, but it has been pretty consistent in showing one fourth of the fleet underway and one third deployed. If the statement above is correct, then, in addition to Coast Guard operations under Coast Guard operational control, We are also deploying in support of Combatant Commanders at essentially the same rate as the Navy. You might also want to look at a report of 23rd Commandant, Thad Allen’s remarks. You may not be aware but several bills have been introduced that would provide pay to either the Coast Guard or to all Federal employees. So far the Senate Majority leader has refused to allow a vote on any of them. I do not believe that six 110-foot cutters in the Persian Gulf constitute “one-third of our operational resources” in in support of military commanders. The use of word “deployed” may be describing performing some of the legislated duties that are traditional to the Coast Guard. The comment does not provide a number. It should be remembered the number of vessels (and I assume he is speaking of vessel and not just some small law enforcement teams) is far less than, say, in the 1960s. The Coast Guard is much less the seagoing service it was in that era. The number of actual people at sea has fallen by some 50% since the 1960s when approximately 75% of Coast Guardsmen were assigned to floating units. It is just playing with numbers. Admiral Zukunft does not understand the Coast Guard’s history. His article is one of statistics in the same form begun in 1880 by the then Head of the Revenue Cutter Service, Ezra Clark. Clark finding no substantive narrative so he devolved to quantitative notations to state the case for the Navy Department mot taking over the USRCS. It has been this way ever since including the false statement that the Coast Guard has saved over “one million” lives. Another example of false historical knowledge is naming a cutter for Sumner I. Kimball. Kimball hated the USRCS and its officers. He found the officers arrogant and uncooperative. The United States Congress and Presidents broke faith with the service long before this blip on the screen. The Service had no full retirement system for its officers of the first 112 years of its existence. USRCS men were not allowed to be buried in national cemeteries until 1911. Treatment at military hospitals required congressional approval. They went decades between pay raises and 19th century POWs waited more decades for benefits. Enlisted pay depended on the prevailing seaman’s wages at any given port – there was no standard until 1922. The Coast Guard should be used to all this. It is part of the history they do not write or understand. Whatever benefits and pay (whether received or not) available today comes from the hard fought battles for respect from the Congress and the American people at large. If that respect is lacking, then it is because the Coast Guard’s hierarchy gives people little more than easily forgotten numbers. I am sure most of the deployed units referred to include the ships working for SOUTHCOM in the Eastern Pacific and Caribbean. Also includes the Icebreaker enroute to McMurdo, but I also have my doubts. Even so I don’t think the Coast Guard has anything to fear from an honest comparison of our underway time with that of the Navy. A couple of news items about the shutdown. I personally have been with USAA for 50 years. Good Company.